For the second time in 11 years, an Indiana State University history professor has received a prestigious fellowship from the National Endowment for the Humanities in Washington, D.C., to continue her research and writing about Russia. Barbara Skinner, associate professor of history (Georgetown University Ph.D.), will use the $50,000 grant for a yearlong leave starting this fall to write about the impact of the religious conversion of Greek Catholics in Belarus and Ukraine to Russian Orthodoxy in 1839, an event that sparked lasting resentments in this region. Her first NEH grant was in 2005 and allowed her time to work on her first book, which is a prequel to this effort. "It's been 10 years, and I have a new project. I figured I'd go for the full 12 months of funding this time," she said. "I learned last time that six months was not enough time." The NEH grants are highly competitive, as about 80 awards are given each year from approximately 1,250 applications. "I'm lucky to have a project that's relevant today, even though I'm working on the early 19th century," she said. "It's critical (research), because we see Vladimir Putin trying to take over eastern Ukraine and saying (that region has) always been Russian." Because of their location between Poland and Russia, Ukraine and Belarus have long received exposure from both cultures -- and integrated them into a pluralistic identity. For instance, Greek Catholicism combines Roman Catholic doctrine with Orthodox ritual. In 1839, however, 1.5 million people were forced to convert to Eastern Orthodoxy, which became the largest mass conversion in the history of the Russian Empire, encompassing 2,500 parishes, 99 monasteries and dozens of schools. "The architects of this policy sought to undo over 200 years of history and to eradicate Polish/Catholic influence in the eight provinces annexed by Russian during the partitions of Poland," Skinner said. "(This research) offers a valuable contribution to European religious history and a deeper understanding of the cultural divisions that continue to shape contemporary events in the region, such as the ongoing crisis in Ukraine." Skinner conducted her second book's research in 2012 while on sabbatical in the region. "What did this (conversion process) mean day-to-day for these peasants? What does this mean about identity for Ukrainians and Belarusians?" Skinner sought to learn by examining parish archival documents in Russia, Ukraine, Belarus, and Poland. "There's some tragic tales there of arrests and imprisonment of those who opposed the conversion," she said. "This study breaks new ground by using a broad, multinational source base and by focusing on the realities at the parish level, examining the actions of parishioners, priests and local agents who aided or resisted the implementation of the policy." NEH grants support research, education and public programs in the humanities, such as pioneering chemical testing procedures to safeguard fragile historical materials and the production of a documentary film on the Warsaw Ghetto's secret archive that preserved 30,000 pages of diaries, letters and records documenting the Jewish community during the Holocaust. "The NEH Fellowships are the most prestigious awards for any scholar in the humanities. For Dr. Skinner to receive one is impressive, but now a second NEH Fellowship confirms her place among the most distinguished scholars in her field," said Chris Olsen, chair of the history department. "It is a special honor for ISU and the department of history, too, and we're certainly proud to have Dr. Skinner as a colleague." Skinner's father was a Methodist minister and Army chaplain, so church history has long been an interest of hers. "Church was always a part of my life," she said. While Skinner, who says she's "as Anglo Saxon as they come," has no personal ties to the region, her advisors in graduate school encouraged her to study this topic because of her linguistic capabilities -- she's fluent in Polish and Russian, among other languages. "Little did I know when I picked my dissertation project that I'd be working on it for 20 years," she said. The application process was due in spring 2015 for awards granted 18 months later. "You really have to have your act together as far as where you'll be in the process and what you'll be doing in that time off," she said. Worse, though, was writing a brief three-page proposal -- further limited by specifications of a minimum font size, Skinner said. "That is still a very short piece to try to convey the importance and complexity of a project I've worked on for many years," she said. "But the challenge now is to write a book that is worthy of the grant." 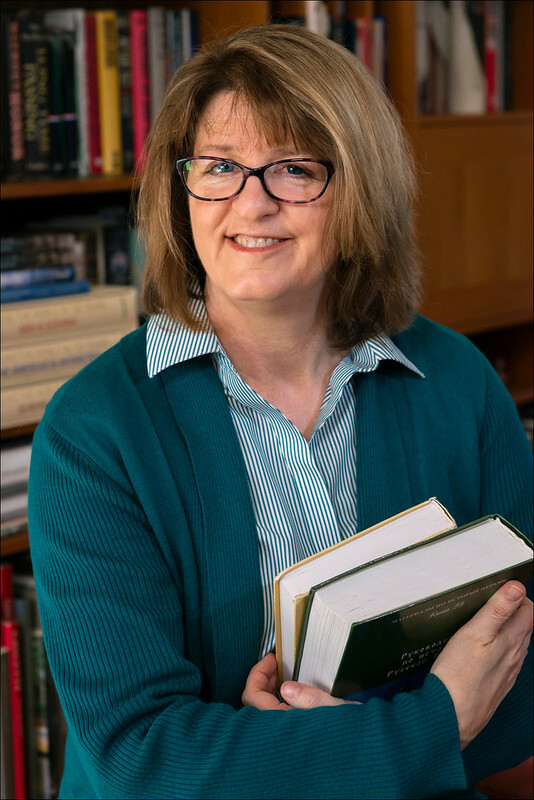 Barbara Skinner, associate professor of history, will use the $50,000 grant for a yearlong leave starting this fall to write about the impact of the religious conversion of Greek Catholics in Belarus and Ukraine to Russian Orthodoxy in 1839.